4lbs Elk HeartElk heart usually runs around 4 pounds. 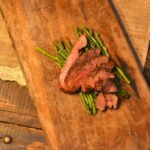 If you’re doing dirty elk heart over the open campfire, skip to the recipe notes below. To cook your elk heart with the stove-top-to-oven recipe, turn your broiler on high and put a cast iron pan under the broiler to get it hot. You don’t need to worry about bringing elk heart to room temperature. As your pan is heating up, take your butteflied elk heart out of the refrigerator and season with your favorite seasoning. In the images in this recipe, I used Montreal seasoning. Take you hot cast iron pan out of the oven, and turn your burner up to high. You want your pan to be smoking hot to get a good char on the outside of the elk heart. Add the olive oil to the pan, and add your elk heart. Cook it for 1-2 minutes on one side, flip. Add your garlic, rosemary, and cook for another 1-2 minutes. Put the cast iron pan under the broiler, and cook the elk heart for 2 minutes on one side. Flip the elk heart, and cook for another 2 minutes on the other side. Take the elk heart out of oven and check the temperature – it should be 130°F for medium-rare. When at the right temperature, put the elk heart on a cutting board, tented with foil for 10 minutes. For dirty elk heart, you cook it much the same as you would above, but you’re cooking over hot coals. Go ahead and season your cleaned and butterflied elk heart with your favorite seasoning. Sprinkle a tablespoon or two of olive oil over the elk heart. Scoot some nice, red coals to one side of the campfire pit. Cook for 5 minutes per side. An ove-glove works well with helping to flip the elk heart. Once done, set on a cutting board, tented with foil for 10 minutes. Slice and serve – or pick it up with your hands and dig in.